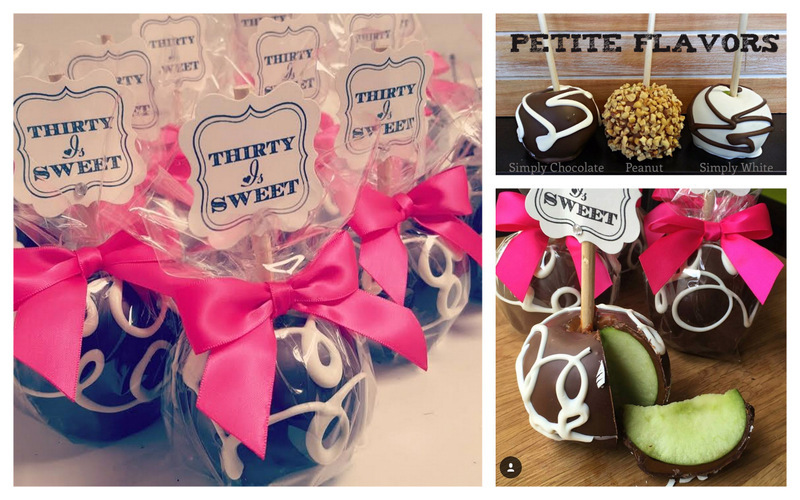 Your guest will love our petite size Caramel Apples which are double dipped in our handcrafted caramel and dipped again in your choice of Dark Chocolate with a White Drizzle or White Chocolate with a Dark Drizzle or Peanut, no chocolate. You can do a combo or have them all the same. The apples come tailor packaged in a high quality/clarity cello and tied with a satin bow and thank you tags. Custom tags are an additional .25 each. 50 Order Minimum. Orders under 50 will be $4.99 plus additional shipping. Includes packaging, bows, Thank you tags and Shipping!!! Price is based on bulk ordering. Contact us below for a quote today! I ordered the caramel apple favors for my daughter's recent wedding. They were a hit. They were beautiful and delicious. The guests really loved them. I got many compliments about how different they were for a wedding favor. They helped may the day very special.. The customer service was excellent. I dealt with Kristina who was the best. Everything was perfect. I would highly recommend you for anyone having an event that needs favors. Again, thank you so much.. Thank you California Caramel Company. I ordered apple favors for my daughter's bridal shower and they were a hit with the guests. The chocolate covered apples were described as fresh, tasty, crisp, delicious and beautifully wrapped. The apples were the talk of the shower. My family and friends loved them so much that I ordered more for my 65th birthday party. This company is exceptional in its response to last minute requests and its personnel is very customer friendly. They treat you like family. A five star rating is not high enough for this company. They deserve 10 stars!! Again, thanks. My daughter's wedding was this past weekend and the whole day exceeded our greatest expectations! But I wanted to take a minute and tell you how much I appreciated your great customer service with our caramel apple favors. They were a huge hit with everyone at the reception; they looked beautiful and they were very delicious! I had so many compliments on them, and I couldn't have asked for anything more. I will recommend you to everyone I know that wants to make their party extra special! Hi, I wanted to write to thank you for our beautiful and delicious favors! Everyone loved them at the wedding. It meant so much to us to be able to give out guests something that would be memorable and a bit different than something they would normally get at a wedding. The pretzels were just perfect. They looked so clean and classy on their napkins. I can't tell you how pleased and overjoyed I am at the quality and presentation of these favors! They make such a classy statement and they are something I'm proud to give to our guests. Thank you for all the time and communication back and forth. I appreciate you and will certainly recommend your company when I have the opportunity!